2017 Sprinter 40' bunk model with auto level, washer & dryer! 2017 40 ft Keystone Sprinter 5th wheel for sale!!! This bunk model trailer has a separate bunk room with own bathroom. The trailer has 4 point auto level, fireplace, remote for activating the slides and lights, 2 Gray and 2 Black water tanks, Extra large hot water tank (no more cold showers!! ), Fire place, outside kitchen with large tv and best of all a washer/dryer unit!!! This trailer has everything you need and more!! Also comes with 16k auto slide hitch (best on the market). Can be viewed at Marine Park in Pouch Cove. 2019 Wildwod 26DBLE "Limited Edition" Bunk Trailer Only $119 Biweekly Tax In! Includes weight distribution towing kit, TV, full propane tanks, roof vent covers, sewer hose, water hose and wheel chocks. 2019 Wildwood 26DBLE with large slide giving lots of floor space. Queen bed in front and two double bunks in rear. Features include power awning with LED light strip, large 22" stainless steel oven, 10.7 cubic foot 12V fridge, pantry, microwave, and outside speakers. Finance for only $99 biweekly tax included. 2019 Wildwood 201BHXL 20' trailer with queen murphy bed and two single bunks. Light weight at just 4100 lbs. Features include power awning with LED light strip, solid step, power front jack, A/C, JT strong arm stabilizer jacks, microwave, 10.7 cubic foot 12 volt fridge, oven, and outside speakers. Includes weight distribution towing kit and starter accessories such as wheel chocks, sewer hose and water hose. 2019 Wildwood 26' Bunk Trailer. Only 4500 lbs. Finance for $99 Biweekly Tax In! 2019 Wildwood 261BHXL travel trailer with queen bed and two double bunks. Lightweight at just 4500 lbs. Features include power awning, recessed oven with glass cover, microwave, JT strong arm stabilizer jacks, power front jack, A/C, 10.7 cubic foot 12V fridge, bathroom skylight and outside speakers. Finance for only $99 biweekly tax included. Includes weight distribution towing gear, full propane tanks, battery, water hose, sewer hose and wheel chocks. 2011 Cruiser CF32CK Fifth Wheel. Ultimate Couples Trailer. Awesome trailer. Tons of room. 4 slides. Shower Large kitchen. Large living area. Large bedroom. No bunks. Sleeps 6. 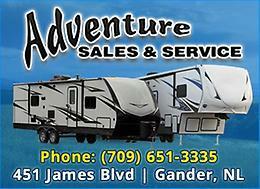 For sale 2012 Jay Flight Swift travel trailer. In Great shape not much use. It has rear bunks and double bed in front. For sale 2011 30ft Salem travel trailer slide, bunk room, outside Kitchen, queen bed up front. $15500. Obo call or txt 427 2816.